Summer Vacation Is Over But The Reading Goes On! Summer vacation went by so very quickly that it was here and gone before I even recognized what had happened. Because of this, I was a little late changing the library's summer reading display to a back to school display. Fortunately, the local children had only been in school a week and a half, so I modified my display just a bit to read: Time to put on your thinking cap and read some good books! I love visiting our local library, I love choosing books for my reviews, changing out the display case, talking with the librarians, and so much more. Which causes me to think on all the ways that books touch my life. I learned to cook fairly well with the aid of cook books, a skill which I use weekly to feed my family and my farm market customers. I often read for relaxation, a good giggle now and then, and to learn new facts, all of which I hope are evident in my book reviews. I read my Bible for comfort and direction. And, I read to my daughter to instill in her a love of words and ideas which will help her world ever expand. These experiences are woven together so seamlessly like a fine woolen scarf that they are an integral part of who I am and why I think reading is so important. The reason why my motto is __ Helping children open the doors to the reading universe on book at a time. So now that I have bent your ear with my soap box ramblings of the importance of reading, here are the two books I read this week. The first is Stanley's Garage. 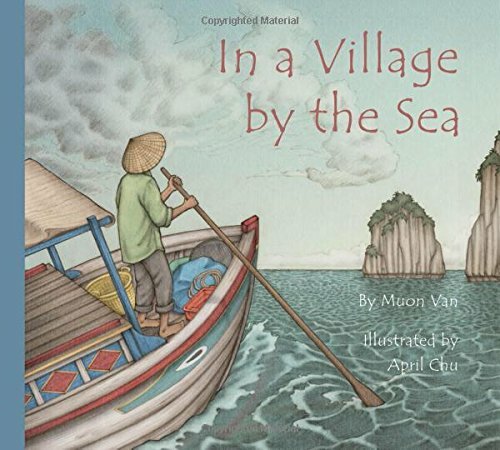 It is a really simple story with lovely but simple illustrations. Great for children from about three to five, this is the story of Stanley the hamster and his garage. 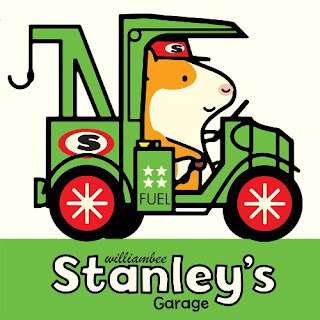 Stanley helps many friends with their automobile problems and introduces colors along the way. Each car is a bright new color. 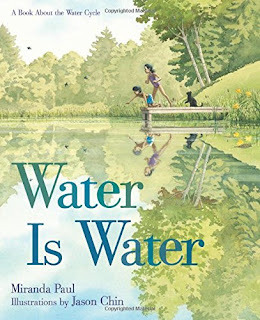 I also read Water Is Water which is a spectacular book about the water cycle. 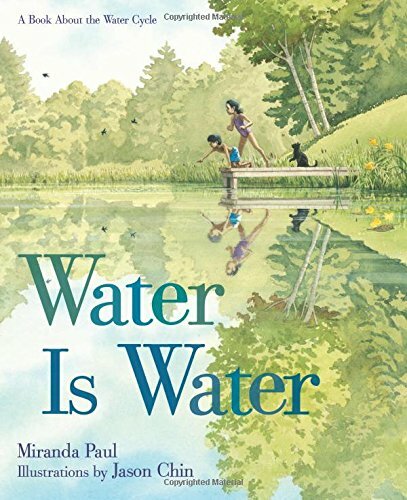 It covers every imaginable form of water from steam to ice and the illustrations are so incredibly beautiful. I love the well done rhyme scheme that the story teller uses and the added bonus facts at the end. This book would be a great addition to any science class be it home school or traditional. Well, that about wraps it up for this week. Join me next week for another exciting episode, same crazy time, same crazy channel. And feel free to drop by my personal website, Fun With Aileen, any day of the week for even more on reading, writing, my very own early grade chapter book, Fern Valley, the sequel, Return To Fern Valley, the soon to be released Cooking In Fern Valley (fall 2015)and my very first picture book, Quack and Daisy! I'm also on twitter @AileenWStewart if you want an extremely brief glimpse into my days. At our home we have lots of pets. We have three regular pets in the form of cats which includes Max who sometimes thinks he's a dog, Daisy who is an itty bitty kitty without a tail, and her daughter Fluffy who is scared of feet. And then we have all of Emily's Webkinz which probably number close to two hundred. She has received them as gifts, has found them at garage sales, and has saved them from unmentionable doom at the thrift store. To her they are more then stuffed buddies, and I am regularly called upon to make beds for them. This past weekend, I even found a large rectangle basket which I knew would make a perfect bed for one or two of them once I make a mattress and bedding. And if truth be told, I would much rather make bedding for oodles of pretend pets then have any hamsters, goldfish, parakeets, or such join the family. By funny coincidence, two books out of my stack from the library had to do with pets. I'm beginning to believe that there really are books about everything related to my life. 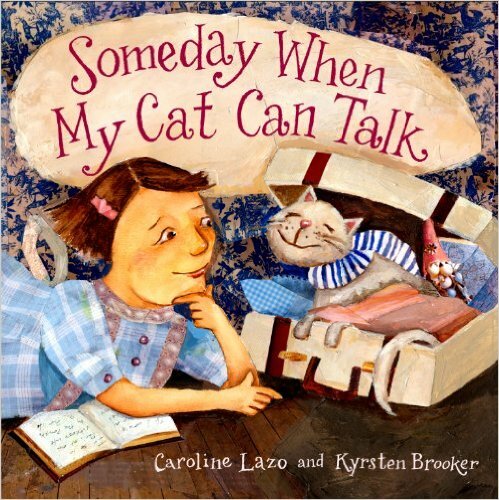 Anyway, the first book was called Someday When My Cat Can Talk. It is the story of a young girl who imagines that if her cat could talk he would tell her about his travels around the world. As an added bonus at the end of the book, there is a section that lists facts about the countries that the girl imagines her cat has visited. There are fun facts about England, France, Italy, Spain, Austria, Greece, and Holland. This would be a good book for any young child, but it would be an especially nice addition to a homeschool curriculum where the child was studying countries around the world. 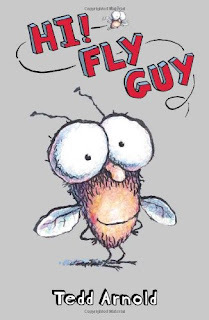 The second book I read was Hi Fly Guy by Ted Arnold. A boy name Buzz goes looking for a pet when he runs into fly. He takes him home and decides he will make a great pet. Other people in Buzz's life seem to think a fly for a pet is not a good idea, but Buzz believes his fly, who he has named Fly Guy, is a very smart fly and a wonderful pet. Adventure ensues as they attempt to prove this fact. Well, that about wraps it up for this week. Join me next week for another exciting episode, same crazy time, same crazy channel. And feel free to drop by my personal website, Fun With Aileen, any day of the week for even more on reading, writing, my very own early grade chapter book, Fern Valley, the sequel, Return To Fern Valley, the soon to be released Cooking In Fern Valley (fall 2015) and my very first picture book, Quack and Daisy! I'm also on twitter @AileenWStewart if you want an extremely brief glimpse into my days. 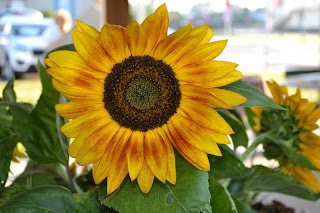 This past week was the normal kind of busy with an orthodontist appointment, school shopping, and farm market; but Saturday was extra busy because on top of market, we went to the fair. 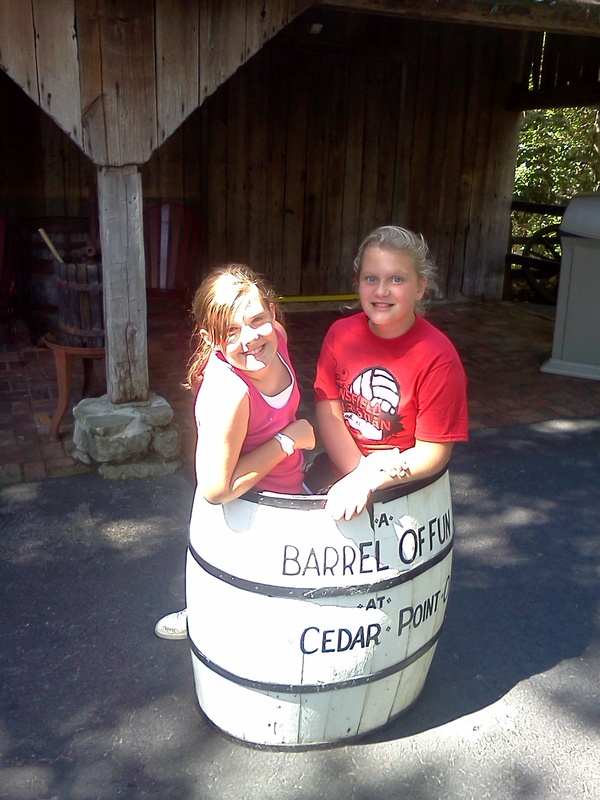 I sure was tired at the end of the day, however, it was the kind of tired you don't mind because it was so much fun. But previous to the fair fun, that morning during the market, I was talking to one of my vendor friends, and she mentioned she was on a gluten free diet. Thankfully there are many options for those who need to go gluten-free. I even noticed that Aldi stores now have a small line of gluten free products. Amazingly, when I picked out books on Friday, they happened to be about a busy day and a gluten free birthday party. Who knew that was exactly what I would experience the next day. 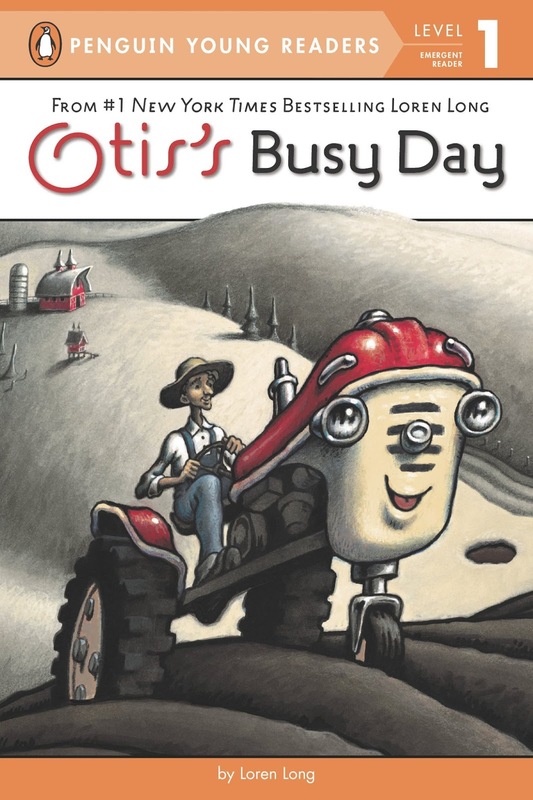 The busy day book I chose was by Loren Long, and it was called Otis's Busy Day. Otis is a tractor and he lives and works on a farm where he does many things. One of my favorite things he did in this story was to make a new friend. Simply written and smartly illustrated, this book and the other Otis books are great for beginning readers. The gluten free book I happened to choose was A Gluten-Free Birthday For Me. It is the story of a small girl who was having a birthday party. Since she has to eat gluten-free, her mother made a special gluten free cake. The party was going well until it was time for dessert. One boy who also needed a gluten free diet felt sad and told her he couldn't have cake. She reassuresd him he could and the party ended on a very happy note. 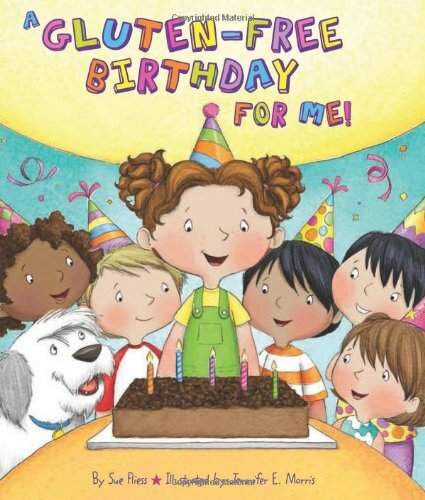 At the end of the story, the author also listed several web sites with gluten free resources. After our fun Cedar Point trip, this past week was all about getting back into my normal routine. That meant baking away for farm market. One of the things I love most about farm market is my vendors who have become like an extended family to me. We laugh, we joke, we help each other, and we visit. And every Saturday, I take joy in each item that my vendors show up with whether it's a beautiful sunflower from Rosemary's garden or Dale's hot pepper butter. Taking time to smell the roses, appreciating everything, working hard at all we do, or thinking of how we can enrich the lives of others is not always a concept that children grasp, but as a parent, they are lessons I want my daughter to one day practice wholeheartedly. And once in a while, I find some great books that subtly bring home these messages. This week, one of those books was In a Village by the Sea by Muon Van. It is an extremely simple story told with very few words, but it conveys the importance of family. It starts with a small house in a fishing village. It describes the house. It tells who is in the house. It tells who occupants are wishing was with them. Finally, it comes beautifully full circle when it shows the fisherman wishing he was home with the family who was missing him. The second book I read was Moustronaut by Astronaut Mark Kelly. 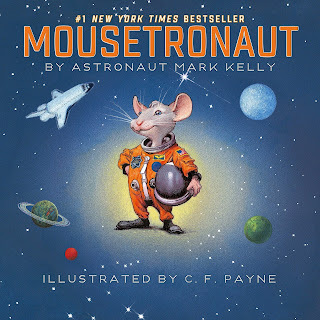 It is the story of a small mouse who worked hard in preparation for a space voyage despite the opinion of his fellow mice that he was too small to be chosen. Delighted beyond words when he is chosen, Mouse searches diligently to find a way to be useful to the crew. Eventually he finds his purpose and it brings him great joy. I imagine he felt the same joy I feel from managing the market and finding ways to be useful to my vendors. 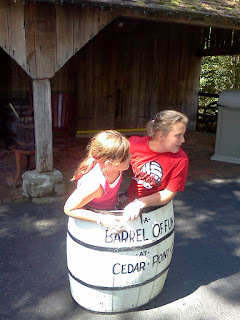 Cedar Point and Some Amazing Adventures! This week I took a rare Saturday off from the farm market to attend my husband's company pic-nic at Cedar Point. Since neither Bobby or I are super big roller coaster fans, we let Emily invite a friend. 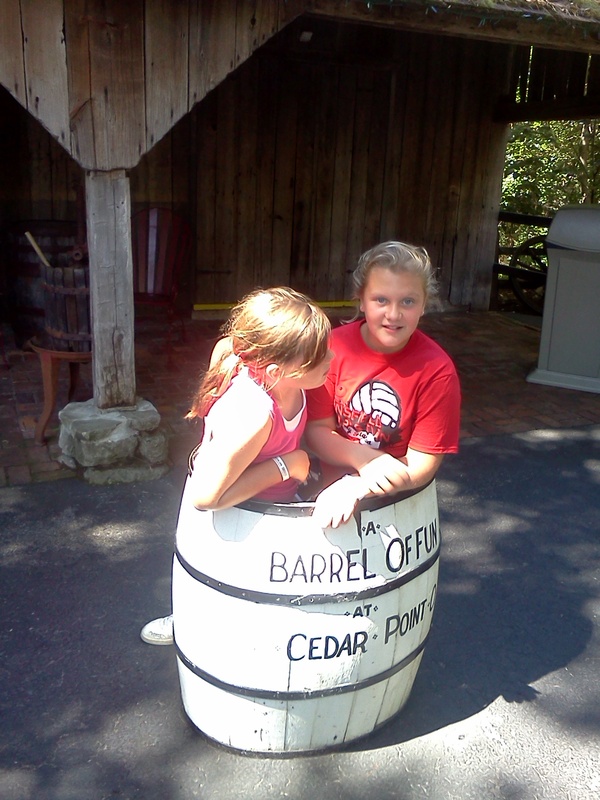 I haven't been to Cedar Point since Emily was three and we went with her cousins, my mom, and my sister-in-law. My husband hasn't been since 1979. So needless to say, it was an amazing adventure. We spent the morning riding rides in the main park and then after lunch, we went around to the water park side and cooled off. It was very exciting, except for the long lines at the most popular rides; and the girls had a barrel of fun. The books I read this week were also about amazing adventures. 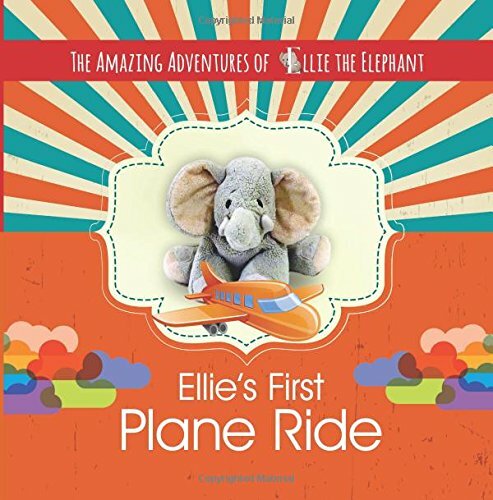 The first was called, Ellie Makes A New Friend; and the second was called, Ellie's First Plane Ride. I won both of these books in a recent contest and wasn't aware until they arrived at my door that they were co/written by a ten year old and her mother. There were several pros for these stories, one of which was the age of the main story teller. I think when youngsters have books published it not only encourages them, but also other children who might dream of writing. These stories were about the authors two favorite stuffed buddies which is also something that children can relate to. 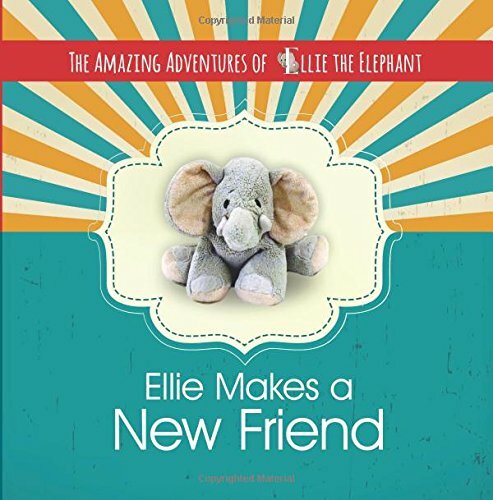 Exciting additions to the books included a page that invited children to take a selfie with their favorite plush and share it on a special face book site, as well as the fact that a portion of every book goes to help children in need. However, I did feel that there were several cons for these stories as well, one of which was the age of the main story teller. The fact that a ten year old wrote these stories probably accounts for the number of grammatical and punctuation mistakes in both books. Mixed verb tenses used throughout and a large quantity of sentences starting with the word "but" made the reading a bit more difficult. A family member is credited as having edited these book which may also have contributed to the numerous mistakes I found. Despite the first book having won a Mother's Choice Award, an award that you have to pay a large fee for, I would not say these books are stellar reads. 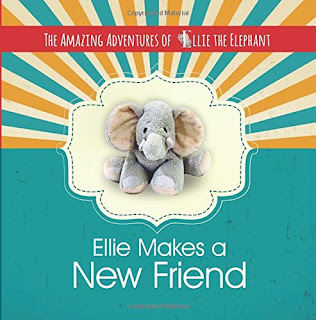 But if you are looking for books written by a ten year old about friendship and new adventures; and you have children who love stuffed animals, then these books are worth taking a chance on.